When I left Sister's at close to midnight Sunday, a bright moon, high in the sky, illuminated the often inky-dark streets for my trip home. It had cooled down after a 100° day and the chill banished the drowsiness that fell over us watching late night Olympics. I pushed a little, feeling alert to the surroundings. I spotted a deer, frozen at roadside along the peripheral road (I giggle at the term, but it is a public road that skirts our private development), and a couple-hundred feet farther, another deer, statue still. I had enough speed to activate the deer whistles and the deer were behaving exactly as advertised. I turned into the garage listening to CNN for any updates on the murders in the Sikh Temple in Wisconsin. Information remained scant. That marked a somber end to the weekend. Without the anchor of appointments on a calendar, my recollections of just what I did are a mishmash, and that that pretty much applies to my weekend. It was a combo of work and play and I can't even guess the proportions. 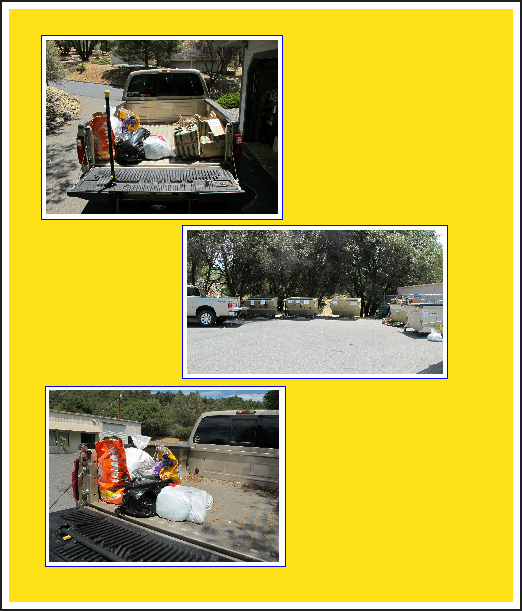 I knew I had to get to the dump transfer station between something (too early to be relevant) and 3:45 on Saturday. It's only open Saturdays and Wednesdays and I have appointments for Wednesday. It's amazing when I put my stuff in the truck that it looks like so little, not spilling over like most people's trucks. The stuff on the left is for the transfer station, on the right is recycle. It really looks like a lot more in the garage than in the truck, and the used kitty litter could come to smell a lot worse with hot days ahead if I waited much longer. About halfway to the recycle station I realized I'd only brought paper and cardboard recycles, and had forgotten cans, bottles and plastics. Rats. It's for the panorama at the transfer station site that I enjoy my little trips up there every couple of months or so, such as the view out over the old landfill area in the photo up top, and of these other directions, especially when sculpted clouds dot the sky. The weighmaster noticed my shooting in his direction and wondered what I was up to. "Like the scenery, like my trips up here, like taking pictures all the time for my blog." Maybe he's concerned I'll be trashing his transfer station in some way. Far from it. The service is impeccable; there's a young man who gets the heavy bags out of this old lady's truck and tosses them in a hole that swallows them up and carries them off somewhere to be transported far far away. I noticed on my way home that the clouds in the east were getting darker and thicker toward the mountains. Rain building up over the Sierra? Another weekend task was preparing -- well, updating an older version of -- a flyer for the computer club's annual BBQ and sending it out. No biggy there. Fun time, way too much of it, is spent on Facebook. In June I began participating in a Photo A Day challenge organized by a blogger in Australia who issues a monthly list of words. Participants post a photo each day illustrating the day's word on their choice of social media. I had fun doing this while on the French Alps tour and my fellow-travelers and leaders joined in spotting subject matter for me, leading to lots of collages when I couldn't decide which photo to pick. 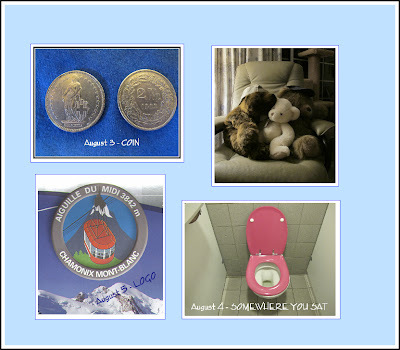 Late in July I joined a Facebook "Group" to share pictures. The woman who organized it started with a group of friends, but made it possible for others to join. It has people from all around the world and I think we're all enjoying seeing the posts pop up from different time zones and the different "takes" on the topics. I put together a collage here of my photos-a-day for this past weekend. Friday's word was COIN and I portrayed the change I got paying for a meal in euros for which I received Swiss francs. I guess that means I have to go back to Switzerland. Saturday's word was SOMEWHERE YOU SAT. I took the picture of the Teddy Bears, who have preempted the comfy chair in my bedroom. I would reclaim the chair, but so far Jean-Luc hasn't noticed that the Teddys are stuffed animals, something he eats. If I move them, I'm afraid they'll come to his attention and I don't want another animal eaten. There was a lot of speculation in the Photo-A-Day group as Saturday approached on whether anyone would post that-place-we-all-seem-to-sit. And I thought of the pink toilet had encountered in the ladies' restroom in Paris-Charles-de-Gaulle Airport a year or two ago. I got such a kick out of it that I ran upstairs to get my camera from my carry-on bag, being watched by my traveling companions, and raced back down to take its picture. I wasn't the only one, but I was a fairly early one, to post a toilet. 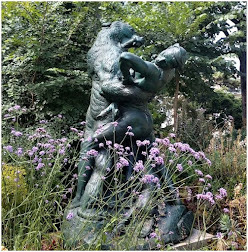 I thought it was pretty enough not to be too tasteless to show, and it got quite a few "likes" and comments. The word for Sunday was LOGO. I initially wanted to do my college's logo, but I couldn't download a picture of it any larger than a postage stamp. Then I noticed the Aiguille du Midi logo on the map and brochure from my trip to the mountain top. The Olympics, which play on in the background, apparently took some time off for cartoons, to Jean-Luc's fascination. Attempts to change the channel were thwarted, as he had stationed himself in front the the sensor that the remote must access. He would not be moved by any verbal request. Outside, the sky was getting darker and the air muggier. Maybe rain here? I left the door behind my chair open so I wouldn't miss the pitter-patter of raindrops. It promised. But it didn't come through. Sunday morning I received an email from Sister inviting me to dinner that evening. (I'm seldom one to turn that down!) After that, the computer club flyer went out and I ran into another bundle of Facebook fun. 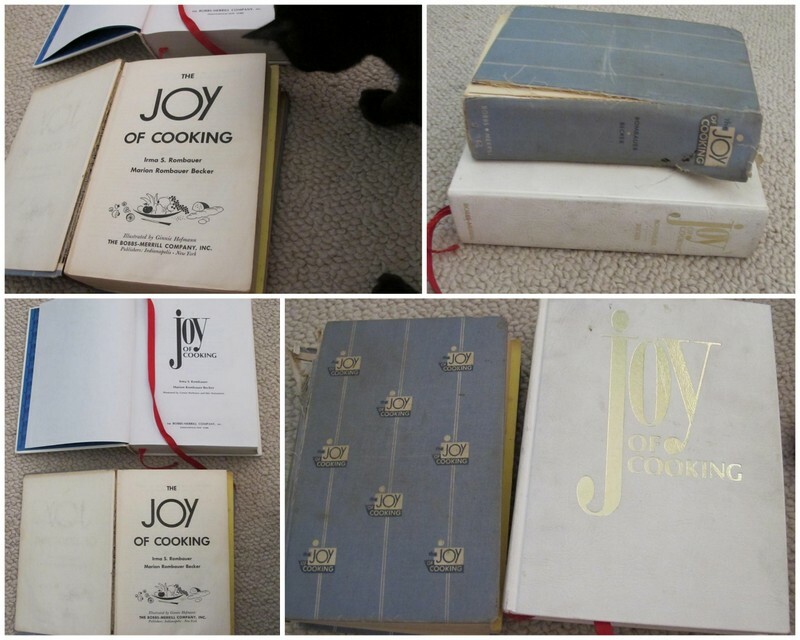 Someone posted a not-so-old picture of Joy of Cooking under one of those "If you remember this, press Like" games. I commented that I had that new version and a much older one which I preferred. The discussion of favorite cookbooks burgeoned. 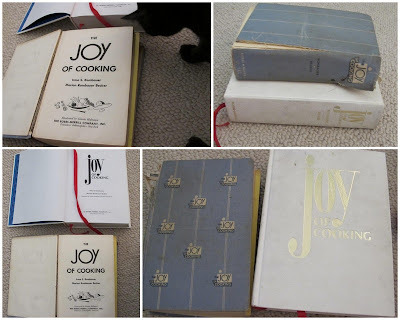 I took photos of my Joys of Cooking, contrasting my beloved beat up 1953 printing (gosh, I wasn't even out of high school yet) with the new 1975 version. From every angle. There are similarities and there are differences, not the least of which is that the old one looks better-loved, and more fragile. Brother-in-Law greeted me when I arrived at their house, and, shushing me, led me around back to see this big boy. Lola with the beautiful eyes greeted me. Healey gave me an "Are you looking at me?" look. It didn't occur to me at first, but there is a Photo A Day of GLASSES this week. This looks like a good candidate. Brother-in-Law barbecued the tri-tip, which was accompanied by corn-on-the-cob, baked potato and salad. We took our chocolate cake, ice cream and tea out on the deck to finish up, as it had cooled down enough. "Look up from your cake! I'm taking pictures." I'll see you soon. I want to write more often and become shorter-winded if I can get myself in the rhythm.